The AX-3000 All-in-One Touch Screen POS solution combines the rock solid reliability and performance of embedded POS terminals with the flexibility of PC based technology. The unique hardware design will deliver lightning fast performance year after year without the need for expensive hardware or software upgrades. maximizing your return on investment. The graphical user interface can be customized to suit each individual business, simplifying operations and minimizing staff training time and cost. Users are guided through all the operations even without manuals or training. Unfortunately, nearly all retailers that handle cash transactions are affected by cash discrepancies. The AX-3000 has been designed to help you control your cash and your profits. Cash control starts with operators having a unique and secure login device ie an i-button. The AX-3000 records every transaction that an operator makes and provides a range of reports that will enable you to identify fraud. Simple end of shift cash declaration procedures compare computed sales values with actual cash in drawer values – highlighting discrepancies. For the ultimate in security the AX-3000 can be linked to a CCTV system that records line by line transaction data with live video footage of the POS terminals in operation. As a lower cost alternative it is also possible to analyze live transaction data, based on pre-defined criteria, using Uniwell.net Alert software. For example, the system could be configured to immediately text or page the manager every time a void over a certain pre-programmed amount is done. Many businesses cannot justify the time and resources to manage a fully featured stock control system. The AX-3000 comes as standard with a simple stock control system that, with minimal effort, will provide accurate stock control for the key product lines. A wide range of detailed reports provide managers and owners with the information they need to control and drive the business forward. 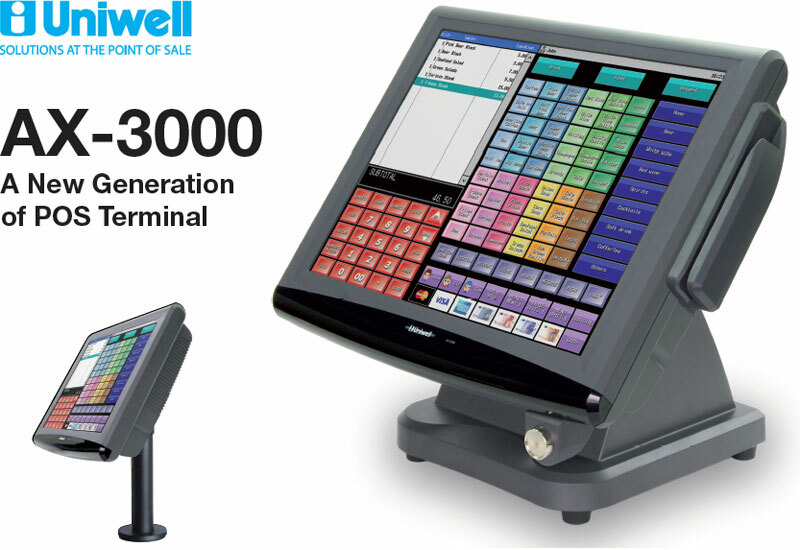 The AX- 3000 can be configured to automatically send sales data (in XML format) to a remote FTP server or Uniwell’s web based reporting service . DataSmart and UniPortal. The system can be configured to ensure that operators have to clock in and out of the system before they can start their shift. The clock in/out times can be used to calculate hours worked and labour cost per employee. One of the unique features of the AX-3000 is that it can also be configured to accept orders directly from a customer’s mobile phone or web orders if used in conjunction with our mobo2go ordering system. Imagine your customers delight at being able to pre order and pre pay for items having specified the time and store that they wish to collect their order. A range of multi buy, combos and meal deals can be configured. In addition it is also possible to schedule price changes for “happy hour” style promotions. It is important to be able to configure and run promotions but it is even more important to be able to monitor the impact of the promotion. The AX-3000 provides detailed pricing reports that show the effect of promotions. The AX-3000 can be configured to run a simple low cost loyalty system that will allow you to provide loyalty cards to your customers and provide them with preferential pricing and discounts. The in-built customer database keeps track of what customers are ordering and when they last ordered. In a busy restaurant it is vital that tables are managed efficiently to ensure good customer service and optimize table turn times. The graphical table plan can be configured to match your exact table layout and changed to accommodate new layouts. At a glance, waiters can see who is sitting at which table, the order status of each table and the dining duration. Years of trouble-free operation with Uniwell’s robust hardware. Small footprint, ideal for small areas in bars and waiter stations. Wall / Bracket mounting option standard. Flash ROM technology gives a stable operating system platform without the system lock-ups of normal computer systems. Shared printing and printer-less work stations mean less financial outlay for a total system. A range of printers allows you to choose the must suitable print type for the environment the printer is in, e.g. impact printers with black and red print to highlights cooking/preparation instructions for printing kitchen and bar orders. thermal printer with a customised graphic logo for customer receipts. Reporting and product maintenance with back office PC communications and internet access as standard.